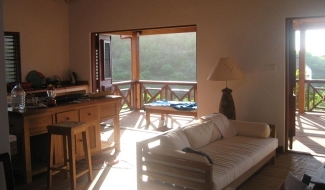 ZANDOLI is a newly built three bedroom, spacious two storey wooden house on Pigeon Beach Road. 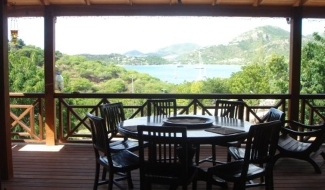 Set on the gently sloping hillside within the National Parkland of Historic English Harbour and Nelson's Dockyard it is close to the lovely sandy Beach at Pigeon Point 3 minutes walk away. 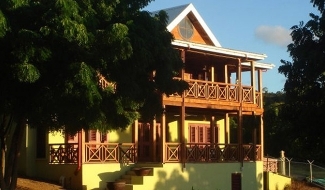 Beautifully designed and built in traditional Caribbean style, it has painted Jalousie wooden shuttered doors and windows to catch the breeze. 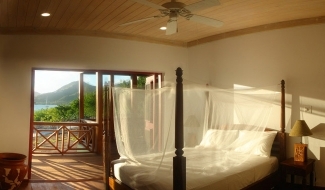 The two large wooden verandas have south westerly sunset views across Falmouth Harbour towards Rendezvous Bay. There are ceiling fans in all rooms and on verandas. Maid 2 days a week. 2 mins walk to Pigeon Beach & 10mins walk to all shops & restaurants & bars at English harbour, Falmouth harbour and Historic Nelsons Dockyard makes car not essential but recommend hiring one for exploring Antigua and St Johns the main town.